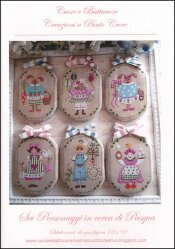 Sei Personaggi in cerca di Pasqua [G1425] - $13.44 : Yarn Tree, Your wholesale source for cross stitch supplies. Cross stitch pattern by Cuore e Batticuore. Six characters ready for Easter. Stitch count 72 x 98 each figure. Stitched on #3643 Edinburgh Linen light mocha.